Houston’s Bayou Greenways plan is perhaps the largest active transportation project in the country right now — if residents can actually use it for transportation when it’s completed. Jen Powis of the Houston Parks Board has described the greenway project as a cross between the Atlanta Beltline and the Portland Bike Master Plan, which “re-envisions transportation” in the city. The project is undoubtedly ambitious, but it remains to be seen whether the city will create safe street-level walking and biking connections to the greenway network. 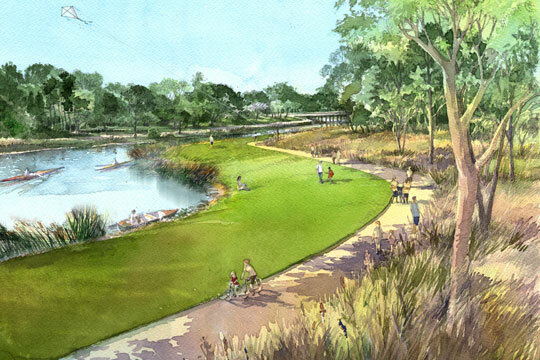 Construction of the Bayou Greenways is already underway. Once complete, it will consist of a comprehensive network of greenways and walking and biking trails along the city’s many natural bayous. The plan comes from a blueprint more than 100 years old. It was part of early city planner Arthur Comey’s vision for the Houston park system back in 1912. And in many ways, it’s brilliant. Greater Houston has 10 major natural bayous, which flow out toward the Gulf of Mexico, spread fairly uniformly across the region. These marshy areas aren’t suitable for development, but they can be used for active transportation and recreation. Already there are some 70 miles of disconnected biking and walking paths along these waterways. The $480 million project will create a network of 300 miles of paths and some 4,000 acres of parkland along these waterways over seven years. If it were completed today, it would be the country’s largest urban trail system. Linking together the bayous and sprucing them up is expected to pay big dividends. 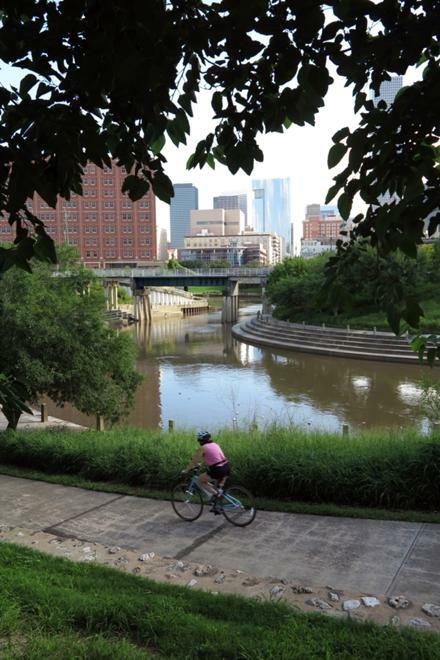 For one, it will greatly expand recreational amenities in the region; six out of 10 Houstonians will live within a mile and a half of a trail or greenway. The city has estimated the combined economic return at $70 million per year. Of that, $10 million is expected to accrue annually from increased property values near the parks and improved business attraction and retention. Another $10 million is expected to come from enhanced water quality and reduced flooding. Finally, the expected increase in exercise and physical fitness is valued at $50 million annually. Here’s another thing the project has going for it: People really like it as a use of infrastructure funds. In 2012 voters overwhelmingly passed a $166 million bond issue, $100 million of which will go to support construction of the Bayou Greenways. The measure won with 68 percent of the vote — the highest ever for a tax issue in the city’s history. The project broke ground last October. Project leaders aim to finish it by 2020, and they are well on their way to assembling the remaining funds to make it happen. They hope to match the public’s $100 million investment dollar-for-dollar with private funds. The project recently received $50 million from the Kinder Foundation. Jay Crossley of the local smart growth advocacy group Houston Tomorrow says the Greenways plan is really exciting, but he wants to be sure Houston’s local streets offer safe biking and walking connections to the greenway network. Otherwise the improvements may be much less valuable. The city’s new complete streets policy, enacted last year by Mayor Annise Parker, will be especially important as this project moves forward, he said. In a follow-up post, we’ll look at an idea percolating in Houston to use utility line rights-of-way to connect the city’s active transportation network. Stay tuned. Streetfilm on Houston coming soon! With bayou footage!! Great question Angie! There are several great trail networks being built around the country that have limited utility because the minute one leaves the trail the roadways are difficult to navigate by bike or foot to say the least. A lot of them ‘close’ after dark. They aren’t about transportation, rather recreation. And giving criminal records to those on foot or bike who want to get around after dark but think the roads are too dangerous. Andy B, that is a retaining wall, not a crash hazard. And I have no idea what mik is talking about. Our bayou trails never close. Some do get pretty dark at night, given that most of the trails are not lighted. For those of us who live near the trails, they are fantastic. The trail pictured runs right into downtown Houston. Ahhh… Okay. That makes more sense. Had me wondering. It sure looks like from the photo that the rocks are at trail level but on second look I can see that they might not be. A public education campaign on trail etiquette (for cyclists and pedestrians alike) needs to compliment this expansion. I was speaking about trails generally, not familiar with Houston. Most I’ve seen are only open limited hours if at all outside of the day. Agree with country club that we need posted trail rules. Keep to the right and pass on the left are simple no-brainer starters. Amazing how many people walk or job on the left like it’s a street, and groups of two or more who walk side by side across more than half the trail. I’m really enjoying the Buffalo Bayou Park path, and it isn’t even finished yet. As for the displayed picture, the little shoulder with the big rocks, next to the path is very problematic since you could really hurt yourself there if you’re not careful. Obviously designed by a non biker. Really should replace those big bonker rocks with gravel, so that if you had to use the shoulder for avoidance it would just slow you down and not wreck you. What were they thinking?? After all this is litigation heaven, are they trying to get sued? Other than that and some other few minor details, everything else is AOK. Regardless, wear your helmet, please. My mistake, retaining wall really?